Derry City and Strabane District Council is seeking legal advice over the potential for having Londonderry’s name officially changed to Derry. A report on the matter is expected to be brought back before the Council in the autumn. It is more than a year since the council voted by majority to write to the then-Environment Minister Mark H Durkan, seeking clarification on how to go about the change. The motion, proposed by Sinn Fein councillor Eric McGinley, was voted upon at the Guildhall in July 2015. 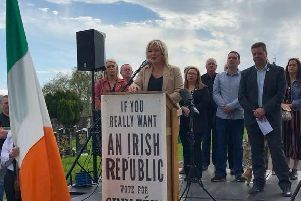 It was passed with the full support of Sinn Fein, SDLP and the independent councillors, despite opposition from the minority unionist bloc. The council took the vote after being told that a request had been received for a public vote on installing Derry as the officially-recognised name of the city. The request was made by the same person behind a Facebook campaign on the issue. Council Chief Executive John Kelpie had received an e-mail requesting that the people should be given the chance to vote and decide on the official name. Speaking at the time, councillor McGinley said changing the name would help market the city under a single name identity. However the move was branded “disgusting” by DUP Councillor David Ramsey. Back in 1984, the name of the council authority was changed from Londonderry to Derry City Council (which has since been adopted in the current super-council name), but the name of the city, for official purposes, was not changed. During a previous challenge, the High Court in 2007 ruled that the name of the city could only be altered via a new law or via royal prerogative. A spokesperson for the current council has now told the Derry Journal that it “is currently awaiting legal opinion in relation to the issue and an update is expected to come before council in the autumn”. The city was called Londonderry when it was given a royal charter in the early 1600s by King James I during the Plantation of Ulster.